1. Start this recipe by heating the oil in a pan. Add in the sliced onion and carrot and fry for 2 minutes. 2. Add in the sliced aubergine and carry on to stir fry for a few minutes. Season well with salt and pepper then remove off the heat. 3. Chop some fresh basil and coriander and mix in. 4. To put the dish together, lay the wraps down and spread with the mayonnaise. Lay a layer of salad leaves down the middle, followed by the stir fried vegetables. 5. Lay on the fish bocconcini, then spoon over the spicy salsa. Finish off by crumbling over the feta cheese. 6. 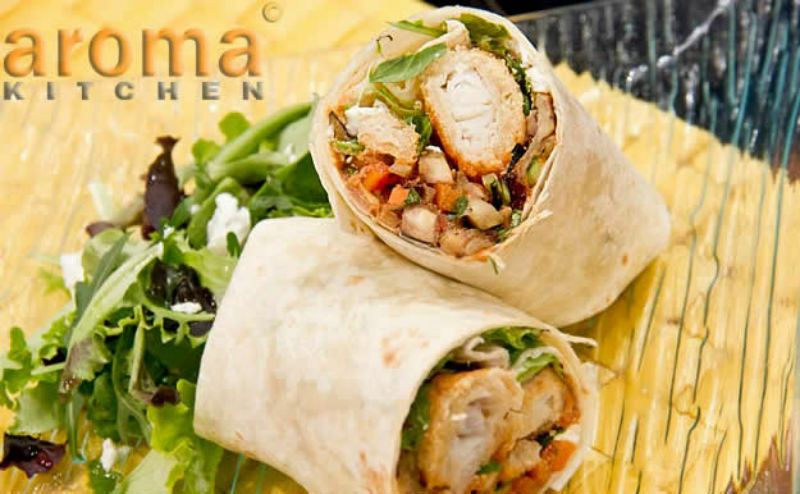 Roll up the wrap tightly and cut in half before serving.